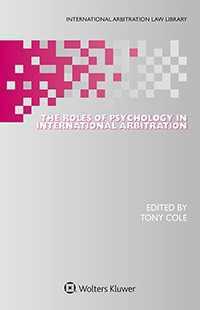 The Roles of Psychology in International Arbitration is the first book to focus on the insights into international arbitration that can be gained from contemporary psychology. The system of international arbitration is built on private contractual relations, yet has been endorsed by governments around the world as a fair and reliable alternative to litigation in State courts. As a private process, however, its authority and legitimacy derive entirely from the views and actions of those involved in the arbitral process, whether arbitrators, counsel, or parties. It is, though increasingly clear that psychological factors complicate, and in some cases radically change, every arbitral proceeding. In this context, psychological insights are crucial for understanding how international arbitration genuinely operates, and whether the legal framework currently applied to it is well suited to achieving the aims of ensuring a fair and reliable dispute resolution procedure. This book meets the increasingly recognized need for understanding the role of psychology in arbitral proceedings and forms an indispensable foundation for subsequent work in this area. methods for arbitrators and legal counsel to more effectively manage the arbitral process. This book demonstrates the benefits to be gained from genuinely collaborative interdisciplinary work and thereby provides a model to be further refined by others in their own attempts to get beyond the domain-specific nature of true expertise. Informed by behavioural insights, this book will enable counsel and arbitrators to think critically about the underlying assumptions and the potential behavioural effects of a range of elements of arbitral proceedings, while individuals researching arbitration will gain a greater understanding into the psychological context in which every arbitration occurs. This innovative and forward-thinking analysis will be of great value to the international arbitration community, as well as to institutions supporting arbitration and to academics in the field. Chapter 6 Disputant Psychology in International Arbitration: What Can a Comparison with Domestic Arbitration Teach Us?